In an earlier post I wrote about What Is Glamour And How Do I Get It? This article provides inspiration on how you can achieve glam style in your home. Some of these items are over the top and inspire vision of luxury while others are simple items that can be purchased online. This over the top bathtub is like having jewelry in your bathroom. 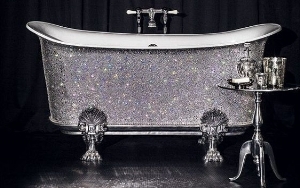 I can't imagine what the cleaning and maintenance is for a Swarovski crystal bathtub but the idea of one is definitely a sure way to add glamour to your home. One of the principles of glam style is texture. Fur texture softens and balances the shimmering and glittery features of glam style decor. This texture can be used on pillows, rugs, and decorative throws. If you're adventurous, you can use fur on your upholstery. Sequin pillows are a great way to add sparkle to any room in your home. Pillows are affordable and can be purchased in multiple color combinations that can be changed seasonally. Adding a touch of sparkle to your bedding can bring glamour to your home as shown on this silky bedding set with sequin accents. Shimmering Sequin Drapes are theatrical. The best way to create this glamourous look is to layer them over drapes in a simple or solid pattern. A Shimmering glitter wall is a dramatic statement for any room. It's best implement this ideas as an accent wall because so much glitter on the walls can create a sensory overload. Artwork can be glamorous. This simple collage contains bits of shimmering metal arranged in a way that provides dimension and texture. These 7 ideas for adding glamour to your home should inspure you to add a little sparkle to your life. What is your favorite idea for addgin glamstyle to your home. Contnue the conversation in the commnets.